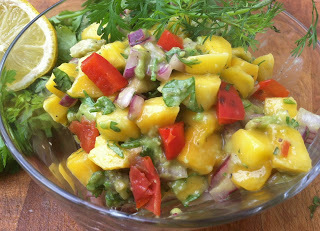 Chop mango, onion, garlic, red pepper, avocado, and cilantro as instructed (into small pieces) and place into a medium mixing bowl. Toss together to mix. 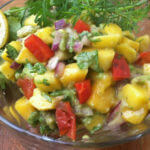 Stir in salt and pepper and squeeze citrus juice over salsa. Toss ingredients together being careful not to over-mix which will turn the avocado to mush. 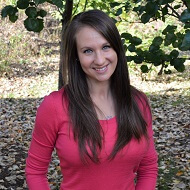 My name is Laura and I am a Registered and Licensed Dietitian Nutritionist in Westerville, Ohio. I am passionate about using holistic practices to help people lose weight and heal chronic disorders with food. My services include customized nutrition counseling, meal plans, online nutrition counseling and lots of recipes! Contact me to schedule a consultation! Get Recipes right to your inbox! The Greeneberger services clients in Westerville, Columbus, Sunbury, New Albany, Dublin, Powell, Lewis Center and surrounding areas. Laura Berger is a Licensed Dietitian Nutritionist. COPYRIGHT © 2016 THEGREENEBERGER, LLC. MADE IN COLUMBUS.